In 1984 whale researcher Katy Payne spent a week with eleven elephants at the Washington Park Zoo in Portland, Oregon, 170 miles south from my Pacific Northwest home. An acoustic biologist with fifteen years of studying the long and complex calls of whales, she was curious as to the kinds of sounds elephants make. She spent every waking hour at the zoo listening and watching the elephants’ behavior. She noticed that certain keepers elicited a positive response from the elephants, an intangible “thrill” in the air, like the rolling vibrations of thunder right before you hear them. On her way home to Cornell University, while she thought about her observations, the throbbing of the airplane reminded her of a pipe organ she once heard. During a performance of Bach’s Passion According to St. Matthew, a shuddering filled the air as bass notes from the great pipes descended in a deep scale until sound disappeared – but the air still throbbed. Those same, strong, vibrations-without-sound had filled the air around the elephants in Oregon. Could they be communicating with infrasound, like whales? Back at Cornell, the first tape Payne selected to review was during a time of silence, when there was a “thrill” in the air as a female elephant faced a concrete wall and a male elephant faced the same wall in an adjoining enclosure. With the wall removed, the elephants would have been within three feet of each other. Running the tape at ten times its normal speed, the researchers heard sounds emerge from silence – elephants carrying on an extensive conversation in infrasound, even when separated by concrete walls. To test the theory, The Cornell research team rigged a double-blind experiment in Africa. An observation tower near a waterhole at Etosha National Park in Namibia was outfitted with video cameras and microphones. Miles from the waterhole, a mobile van roamed through the bush carrying broadcast speakers and tape recordings. The timing, location and content of the broadcasts were unknown to the observers at the tower. A female elephant needs to advertise as far and as wide as she can, since she is receptive to males for just a few days every estrus cycle. She repeats her calls over and over for up to forty-five minutes at a time. The calls can be heard as far as two and a half miles away – over a range of nineteen square miles – but only by other elephants. 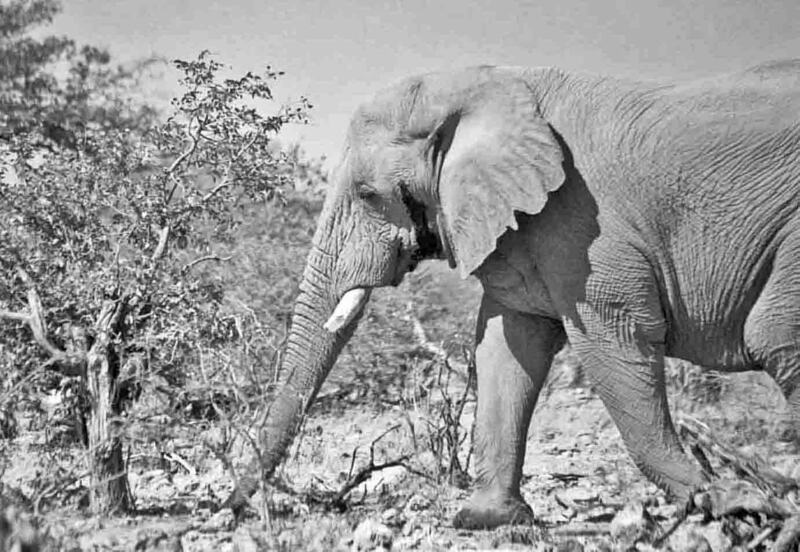 Etosha Male, 1996, with streaming temporal gland, a sign of musth. Mohammed? Hannibal? Fascinating! (Although I was a little sad for the poor bachelors.) You are doing important work here. Elephants need to be protected more than they currently are and until more people understand why it might not happen soon enough. Of course I realize you already know that. I’m so glad you found me so that I could find you. Me too! A Canadian neighbor! Glad you like it, Ella & Gabi. Where in the world are you now? Saw lots of Hawaii pics on FB! I have ‘felt’ the vibration once before, I think. A baby came rushing down an embankment next to the road, mum tearing after it. Within minutes there were three or four females checking baby out with trunks, rumbles and snorts. But there was an electrifying buzz in the air too. After baby was examined, comforted and scolded, they quietly and silently walked off to join the rest of the herd that had come. Appearing curiously and suddenly from another direction, and waiting attentively. Lots of greetings and trunk pats later they melted back into the bush. Curious! Wow, you are so lucky. Where was this? It was in the Kruger Park, South Africa.